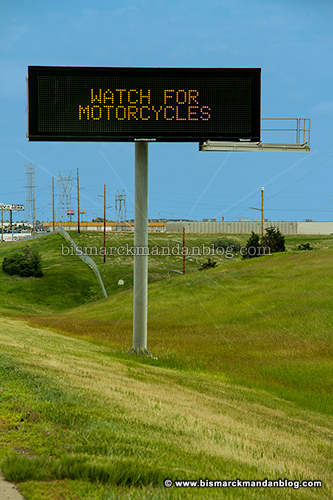 As a motorcycling advocate I was pleased to see this sign on I-94 this weekend. During the pleasant riding months we have a lot of motorcyclists in the area, and I’m sure attractions like Buggies ‘n’ Blues (photos forthcoming) and the ABATE Menoken Rally brought a measurable increase in numbers of two-wheeled motorists this weekend. Whenever I hit an unmarked section of chip-seal gravel around Bismarck I tend to think that we bikers are forgotten…but not by the DOT this weekend! This entry was posted in Government, Motorcycles, Signs, Logos, Typos, Vehicles by Clint. Bookmark the permalink.